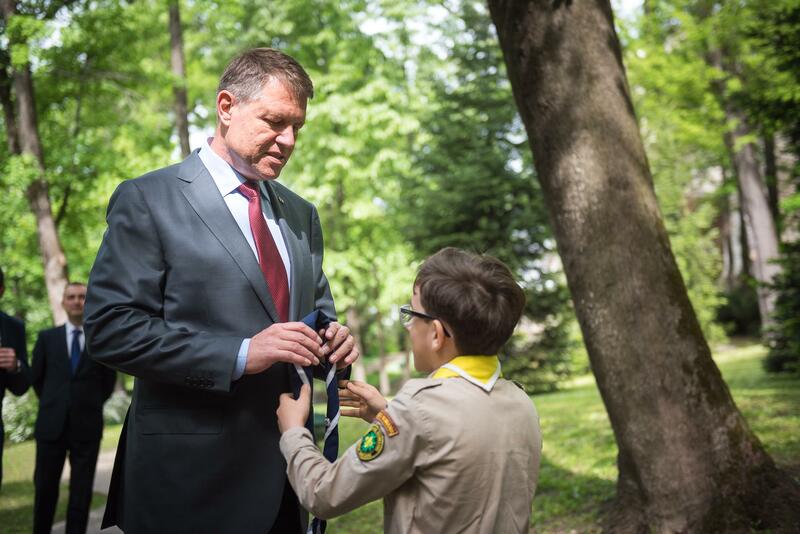 (Bucharest/ONCR) – Earlier this week, Teo and Andrei were part of a group of 13 Scouts meeting His Excellency Klaus Iohannis, President of Romania, in the gardens of Cotroceni Palace, the Presidential Palace in Bucharest. Joining them were Sabin Mureșan, President of the Romanian Scout Organisation, and João Armando Gonçalves, Chairperson of the World Scout Committee. Andrei was very proud to present His Excellency with the Romanian National Scarf (see the picture below) while Teo greeted the President on behalf of the Romanian Scouts (see the title picture). The President was also offered a clay pot produced by Scouts in the recently opened pottery workshop of the Nocrich H.C. Habermann Scout Centre, the International Scout Centre of the Romanian Scout Organisation. But before he met with the younger representatives of the organisation in the gardens of the Presidential Palace, His Excellency had already welcomed Sabin and João inside the Palace. During that meeting, the two sides discussed the possible modalities of re-confirming the Romanian President’s status as High Patron of the Romanian Scout Organisation. The long history of Romanian Scouting was also mentioned, including the starting of the early Scout Groups, which were established well over 100 years ago. In more recent years, the trusted partnership between the Scout association and the Presidency had made it possible to organise the National Jamboree “RoJAM 2011” (in Săliște, Sibiu) and to celebrate the Centenary of Romanian Scouting in 2013 (in Mogoșoaia). 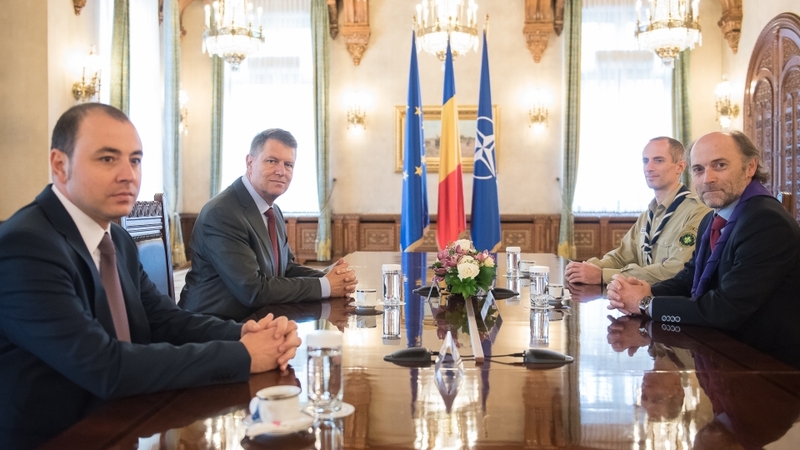 Today’s meeting between the President and Romanian Scouts was a natural step on the way to turning this partnership into an even stronger one in the years to come. For example, the Scout educational programme currently offered to over 4000 young people will in the future only be available through the Romanian Scout Organisation. Concluding the meeting, Sabin extended an invitation to H. E. Klaus Iohannis, hoping that the President would find time to pay “RoJAM 2.017″ a visit next year, when the next National Jamboree and largest event of the non-formal education sector would be held in Cristian (Brașov county) to celebrate the 110th birthday of the Scout Movement.